“Just drop me here and I will walk back” I said to That Nice Lady Decorator in the way back after we had walked a mile and a half around the rather impressive Cissbury Ring in something called sunshine. My normal daily constitutional is 4 miles, so I asked to be dropped off about what I thought was two and a half miles from Arundel so that I could make up my quota. The problem was that my calculation was point to point, as the crow flies. 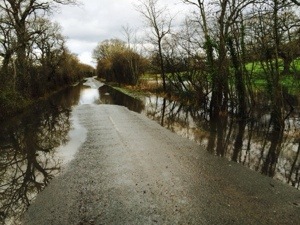 However flooding and the circuitous nature of public footpaths combined to make it nearly five miles back to base. Exhausted, I stumbled into the house readying myself for my work on Currencies Direct. Exciting work as it turns out with the £ buying nearly 1.21 euros at one stage. That done, there were important arrangements to be made for both of my forthcoming breaks to Tenerife and Barbados. Irksome details like arranging a cook and a Housekeeper, booking seats and pre-ordering champagne. All vital for the smooth running of those all too brief holiday breaks interspersing my busy working schedule. Regular limerick contributor and god bothered The Reverend Jeff just doesn’t know when he’s been out argued. He was rattling on long windedly again in the comments section yesterday. I read about half of it before I had to go and get some coffee to keep me awake. He will know in his subconscious heart that he has backed the wrong horse believing in god, but refuses to accept the obvious. I remember him once telling me that the he believed in the fairy story about us all being descended from Adam and Eve, which as I understand it, rules out the scientifically proven Theory Of Evolution. Is that still the fact Reverend? A straight yes or no will do? Adam and Eve or Darwin? What’s it to be Reverend? Don’t forget brevity. I have just realised that Adam and Eve could be shortened to A & E. How apt! As today is Friday, I shall be in search of beer by early evening. A visit to see the poorly Aunt Pam in Guildford tomorrow afternoon will preclude a drink at lunchtime. I think she went into decline whilst listening to the last Ashes test on the radio. She is a huge cricket fan and even at 86 she would give the selectors and the team some verbal if she got the chance. I do hope she recovers in time for the Lords Test next summer. Talking of cricket, I plan to play again this year. I have discovered that there are several over 50’s and over 60’s cricket teams and even an over 70’s team in Sussex. They are having nets at Arundel on Monday and I have been invited to attend. Obviously I am not old enough yet to play in the over 60’s but I will be by the summer, and I fully expect to be in the unusual position of being the youngest in the team (if selected) something that I have been unable to say in any circumstances for many decades. I suspect that the taking of sharp singles will not be prevalent and I also suspect that fielding in the outfield might be unpopular, what with all that running. I have found my cricket whites and my new cricket shoes, and am looking forward to Monday morning when I shall begin to relive my youth. There will be some irony in beginning to play again the same year as I can get my bus pass and free prescriptions. It is a curious time for nets, 10.30, but I guess the main catchment ago are retired, and have an afternoon sleep. I know I do. He’d say something just reprehensible ! My smirk is becoming more self-satisfied by the day as your religious obsession is becoming slightly embarrassing to us all. This is supposed to be a ‘light hearted’ look at the lives of the rich and famous, not an elderly man’s angst ridden and slightly desperate attempt to find meaning in his ultimately meaningless (In your terms) existence before death and oblivion engulfs him!! I have explained it to you so many times even I am getting bored with hearing it !! I get it -you don’t believe in God. Move on and let it go-I can’t say any more that will help you. I have explained on so many occasions that the Bible is a metaphor but you seem stuck over questions I explained when we were 17 years old !!! Will you never grow ? If I’m bored with your inane bleating on the subject think what your poor readers are having to suffer. Stick with telling us about your drinking sessions, partying, holidaying etc. These are your life and what you’re good at reporting. Leave the intellectual stuff to those more suited to the task. By your own admission you don’t read my reply’s because you don’t understand them so what is there left to say ??!! For the sake of your readers sanity just accept your own mortality and see out your remaining days enjoying the short time you have left !! And your ‘searching’ drives me round the bend !! Great limerick Winnie -your English has improved immeasurably ! I must agree with EVERYTHING the Rev. Jeff has to say — I can only add that, in my view, religion and politics are probably topics you should steer clear of on this blog. OK, I appreciate it’s YOUR blog and you’ll write what the heck you like, but I’m here to tell you it IS getting VERY boring !! Lighten up a bit — at the very least, let’s have a CHANGE OF SUBJECT, PERLEEEEEASE ! Thanks for the kind compliments, Rev. Jeff. My English, she is completely self-taught ! But without it, my prospects were nought.